Much has been written about choosing the right motor, estimating performance, installing the motor in your plane, and so on. This month, I’ve decided to go back to basics and describe how the motor actually works. Do you need to know this to fly electric models? Probably not, but a good understanding of the functioning of a motor can help you diagnose problems. And some people, myself included, like to know how everything works. So, if you’re interested, read on! I’m going to start with the very basics, so if you already know some of it, feel free to skip ahead. I won’t be offended. The fundamental driving force behind all electric motors, whether brushed or brushless, AC or DC, is magnetism. We’ve probably all played with magnets at some time or other, and have learned about them in science class in elementary school. Recall that any magnet has a north pole and a south pole (it just so happens that the earth is a magnet whose poles happen to correspond very roughly to the geographical poles, hence the names for the magnet’s poles). If you take two bar shaped magnets and line them up, they will be attracted to one another if one’s north pole is next to the other’s south pole. If you line them up north to north or south to south, they will repel each other. Opposites attract. Consider an assembly of three magnets, as shown in Figure 1. The left and right hand magnets are fixed to some surface, and the center magnet is free to rotate about its center. Figure 1. The central rotating magnet will turn until it is aligned with the two fixed magnets, north pole to south pole. Because of the attraction of opposite poles, the center magnet will rotate until it is aligned as in Figure 2. Figure 2. Once aligned, it will resist being turned further. Because the magnet has weight, and thus momentum, it would actually overshoot slightly, and then come back, overshoot again, and so on a few times before settling down. Now, imagine we could work some magnetic magic and swap the center magnet’s north and south poles just as it overshoots the first time, as shown in Figure 3. Figure 3. If we magically reverse the poles of the central magnet just before it comes to rest, it will keep turning. Instead of coming back, it would now be repelled by the fixed magnets, and keep turning so it can align itself in the other direction. Eventually, it would reach the state in Figure 4, which looks suspiciously like Figure 1. Figure 4. Eventually, it will get back into the position it started from in Figure 1. If we perform this pole-swapping every time the center magnet just finishes overshooting the aligned position, it would keep turning forever. The problem is how to perform this feat of magnetic motion. The magnets we play with are called permanent magnets. These objects have a fixed magnetic field that’s always there. The poles are fixed relative to one another and relative to the physical magnet. Another kind of magnet is the electromagnet. In its simplest form, this consists of an iron bar, wrapped in a coil of wire, as in Figure 5. Figure 5. An electromagnet is just a piece of iron or other magnetic metal with a wire coil wrapped around it. By itself it does nothing. However, if you pass an electric current through the wire, a magnetic field is formed in the iron bar, and it becomes a magnet, as in Figure 6. Figure 6. Applying current in one direction will produce a magnet. If you turn off the current, it stops being a magnet (that’s a bit of a simplification, since in reality, it ends up remaining a weak magnet, but we needn’t concern ourselves with that for the moment). So far, the electromagnet already seems quite useful, since we can use it to pick up iron, steel, or nickel objects, carry them somewhere, and then drop them by just turning off the power (wrecking yard cranes do this with entire automobiles). The really interesting thing about an electromagnet is that its polarity (the location of the north and south poles) depends on the direction of current flow. If we pass the current through in the opposite direction, the electromagnet’s poles will be reversed, as shown in Figure 7. Figure 7. Applying current in the opposite direction will produce a magnet with opposite polarity. If we replace the central magnet in our set of three magnets with an electromagnet, as in Figure 8, we have the beginnings of an electric motor. Figure 8. Replacing the central magnet in Figure 1 with an electromagnet gives us the beginnings of a motor. Now we have two problems to solve: feeding the current to the rotating electromagnet without the wires getting twisted, and changing the direction of the current at the appropriate time. Both of these problems are solved using two devices: a split-ring commutator, and a pair of brushes. Figure 9 illustrates these. Figure 9. By adding a commutator (the semi-circular arcs) and brushes (the wide arrows), we can change the polarity of the electromagnet as it turns. The two semicircles are the commutator, and the two arrows are the brushes. The current is applied to the brushes, indicated by the "+" and "-" signs. With the current as shown, the electromagnet will be repelled by the two permanent magnets, and it will turn clockwise. After it has turned almost half way around, it will be in the state shown in Figure 10. Figure 10. The magnets are almost aligned, but soon, the polarity will reverse, sending the rotating electromagnet on its way around once again. Then, just as the magnet reaches the aligned state, the split in the commutator passes under the brushes, and then the current through the electromagnet reverses, which takes us back to the condition in Figure 9. As a result, the magnet keeps turning. We have a motor! The discussion above has culminated in the design of a simple two-pole, two-slot, permanent magnet, brushed, direct-current (DC) motor. The term two-pole refers to the fact that there are two permanent magnet poles involved in the operation of the motor, the south pole of the left hand magnet and the north pole of the right hand magnet. The motor would actually work with only one fixed magnet (for example, only the left hand magnet), but would be less powerful and efficient. The rotating electromagnet is known as the armature. Two-slot means that the armature consists of a single coil of wire around a single bar with only two ends (the term "slot" refers to the gap between the armature ends, since the armature is not typically bar shaped, but has a wider end). In a real two-pole motor, the two poles are often the two ends of the same magnet. Although the motor may appear to contain two separate magnets, the steel motor case ties them together to act as a single magnet. It’s really as if our motor were built like in Figure 11, with the rotating electromagnet inside a hole in the permanent magnet. Figure 11. In many motors, the two fixed magnets are really one the two poles of what is effectively one magnet (although it may be made up of two separate magnets connected by the motor housing). Practical real motors usually have at least a three-slot armature, and a commutator with three segments. There are however still only two brushes. Higher voltage and higher efficiency motors have even more slots (an odd number) and more segments on the commutator (the same as the number of slots), and more brushes (always an even number). 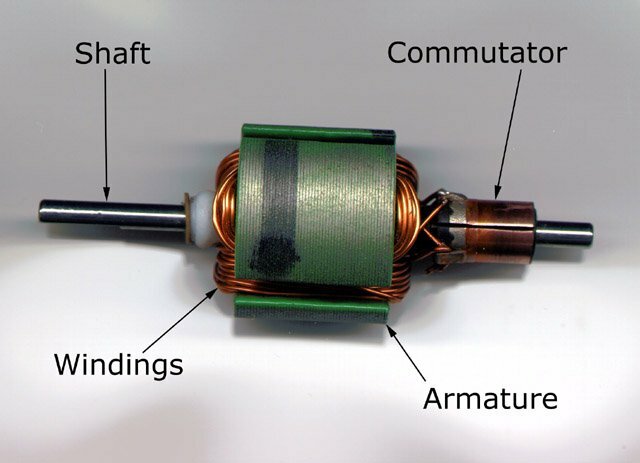 Photos 1 and 2 show the armature, commutator, and brushes from a typical low-cost three-slot motor. Photo 1. This is a three-slot armature from an inexpensive 540-sized ferrite "can" motor. Photo 2. The brushes in a "can" motor are held in place by alloy leaf springs that also serve to carry current. The commutator has been simulated with a piece of dowel with some markings on it to better show how it mates with the brushes. Figure 12 illustrates a three-slot motor in conceptual form. Notice that the brush is now wider, contacting the commutator segments over a wider area, and actually spanning two segments sometimes. Figure 12. This is a schematic representation of a typical three-slot two-pole brushed motor. The armature has three electromagnets, and three commutator segments. The brushes sometimes contact more than one segment. Also notice that both ends of electromagnet number 2 are contacting the "-" brush at the particular point in time captured by Figure 12. This means that no current is flowing through electromagnet 2, and only number 1 and 3 are on. Effectively, the armature is now a pair of electromagnets; number 3 is being attracted by the north pole of the right hand permanent magnet, and number 1 is being repelled. One twelfth of a turn later, as in Figure 13, all three electromagnets have current flowing through them. Figure 13. The same motor as in Figure 12, one twelfth of a rotation (30 degrees) later. Now, electromagnet number 1 is being both repelled by the right hand permanent magnet, and attracted by the left hand one. Number 2 is being repelled by the left magnet, and number 3 is still being attracted by the right magnet. Another twelfth of a turn later, in Figure 14, electromagnet 1 is being attracted to the left hand magnet, and number 2 is still being repelled. Figure 14. The motor from Figure 12, one sixth of a rotation (60 degrees) later. Electromagnet 3 is turned off. This progression of electromagnets switching on and off continues as the motor turns, eventually returning to the state of Figure 12. 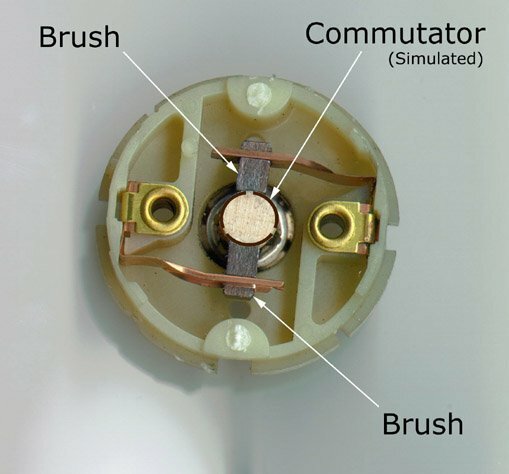 There are a number of drawbacks to the brush and commutator mechanism used in a brushed motor: the brushes cause friction, there is some electrical resistance in the brush-to-commutator interface, and the mechanical switching of the armature current results in sparking, which can cause radio interference. Brushless motors do away with the brushes and commutator to get around these problems. The result is greater efficiency (more output power for a given amount of input power), and less electrical interference. The basic principles by which a brushless motor operates are exactly the same as those of a brushed motor. Figures 15 and 16 show two stages in the operation of a simple brushless motor. Figure 15. This is the brushless motor equivalent of Figure 9. The electromagnets are fixed, and the permanent magnet rotates. Notice that Figure 15 is almost identical to Figure 9, except that there are no brushes and no commutator, and the types of the magnets have been exchanged. The permanent magnets have become electromagnets, and vice versa. The rotating permanent magnet is being repelled by the two electromagnets. Figure 16. The motor from Figure 15, almost a full turn later. Notice that the electromagnets have changed their polarity. In Figure 16, almost a full turn later, the polarity of the left and right hand magnets has changed. The rotating magnet is now being pulled into alignment. The problem to be solved here is how to cause the electromagnets to reverse their polarity at the right time. One could devise some sort of mechanical scheme controlled by the rotating permanent magnet, but this would nullify the main benefits of brushless motors. Instead, the electromagnets are controlled by external circuitry. This circuitry monitors the current position of the rotating magnet, and energizes the external magnets appropriately to keep the motor turning. This circuitry is part of the brushless electronic speed control (ESC). There are two ways for a brushless ESC to monitor the position of the rotating magnet. One is by way of magnetic sensors (based on the Hall-effect). These sensors report back to the ESC through a separate set of wires. The other method is known as "sensorless". Roughly, in this method the ESC monitors the three motor power wires for fluctuations caused by the spinning magnets. Since the electromagnet assembly in a brushless motor remains stationary, it is called a stator instead of an armature. The rotating magnet assembly is called the rotor. Just as a real brushed motor rarely has only two poles and a two-slot armature, a real brushless motor rarely has only a two-pole rotor and a two-slot stator. Most commercially available brushless motors have at least four poles, and a nine or more slot stator. However, for purposes of comparison, Figure 17 illustrates a hypothetical two-pole three-slot brushless motor, corresponding to our two-pole three-slot brushed motor. Figure 17. This is a schematic representation of a hypothetical three-slot two-pole brushless motor. The rotor has one permanent magnet (two poles), and the stator has three electromagnets (three slots) and three connection points. Notice there are three connection points to receive power from the brushless ESC (a motor with more than three stators has them wired in three groups, so there are still only three power leads). Photo 3. The components of an Aveox 36/30/1.5 brushless motor. In the state represented by Figure 17, power is being applied to the two leads labeled "+" and "-", which energizes the electromagnets as shown. The upper left electromagnet is attracting the rotor’s north pole, the lower left one is repelling it, and the right hand electromagnet is repelling the rotor’s south pole. As the rotor turns, the ESC will change which leads have power applied to them. Sometimes only two leads will, as in Figure 17, and at other times all three leads will (just like in Figure 13 for a brushed motor). The theory of motor operation described here is correct, but somewhat simplified. If you examine the diagrams closely, you’ll notice situations where the polarity might reverse too soon, apparently causing the motor to stop. Because of a number of factors, such as the time it takes for the magnetic field to collapse, and the momentum of the armature, a real motor won’t necessarily stop in this situation. The relationship between the position of the armature (or rotor) and magnets (or stator), and the time that the electromagnets change their polarity, is known as "timing". In a brushed motor, it is adjusted by repositioning the brushes relative to the permanent magnets. In a Hall-effect sensored brushless motor, it is the sensors that are repositioned. In a sensorless motor, the ESC adjusts the timing automatically based on the feedback it is getting from the motor. The optimal timing depends on motor speed and current, and for maximum efficiency, should be adjusted for the particular operating condition of the motor. If you are familiar with internal combustion engines, this is similar to setting optimal spark plug timing. Theoretically, the plug should fire when the piston reaches the top of the cylinder (top dead center), but due to engine momentum and the time it takes for the fuel to actually burn, the plug must fire sooner. Modern car engines adjust this electronically to precisely suit the conditions; older car engines used a vacuum driven advance mechanism to adjust it according to engine load. There are many other types of electric motors, such as AC induction motors, AC synchronous motors, stepper motors (really a specialized form of brushless motor), and so on. All of these motors operate on variations of the principles we’ve looked at. They differ only in how they perform the job of the commutator. Currently, none of these other types of motors are used in electric flight. Wow! Great article. It definitely helped me IMMENSELY in understanding how motors work. Thanks again! Thanks for your fantastically clear and precise explanation. I’ve been searching for hours to find how a brushless motor works for my A level physics project and your site is the only one that seems to know what it’s talking about, the others have missed out the entire section on how the motor actually works! Reversing the rotation of a brushless motor is just a matter of exchanging any two of the three wires connecting the ESC to the motor. Hey Stefan, I use for my flapping wing mechanism the Microbatics M5-30-60 High Performance Single Cell Brushless Motor (M5-3-60) and the ESC micro invent MBC3, but it doesn’t work. I hear the state beeps of the controller, but the motor is not running. Do you have an answer about this problem? Or do you have experience with this motor and this ESC? Tobias, it sounds to me like one of the windings might be broken (or the connection to one of the windings). If you measure between each pair of motor leads with an Ohm meter, do you get approximately the same readings? If not, then that’s probably the problem. Otherwise, I’d contact the motor manufacturer. The proper point to power on and off the rotor is the 45 degree point between the poles. On the true sensorless rotor the way you do this is to start a counter at a zero crossing and stop it at the next zero crossing. At that time of the second zero crossing you store that count and then start a second counter that is twice the speed of the first counter. That counter will count down to zero. Example the number in the counter was 90 and now you double the countdown rate until the counter reaches zero. That point is then 45 degrees between the poles and you turn the power on for that stator. Thank you for your answer. I have not specified the problem fully though. The motor is actually moving, but it changes the rotation direction approx. once a second, so there is something wrong. The controller IS calibrated (according to the manual). The motor manufacturer is Microbatics, and as far as I know they went out of business, leaving a large amount of motors on the market, and no dedicated controllers for them. The most information on the motor is here: http://www.bphobbies.com/view.asp?id=V510387&pid=DU105 and the controller: http://www.microinvent.com/mambo/images/stories/pdf_files/mbc3-man.pdf. Would you have an idea why the motor acts so strangely? Thank you! Craig, I assume you mean the "half way point", not the "45 degree point", since the latter only makes sense if the motor has exactly four poles. However, I have to disagree with your statement. This would only be true if (1) the motor was operating with no load on it, and (2) collapsing magnetic fields took zero time. In practice, motor timing is advanced significantly, meaning the switch-over point happens sooner than you’d expect. This is analogous to internal combustion engines, where the theoretical correct time to fire the spark plug is when the piston reaches top-dead-center, but the actual correct time is much sooner than that. Stefan, Thanks for the information about motors, you have explained it quite eloquently and yet simple to understand. Question: I have purchased some DC motors from Radio Shack that are high speed, 18vdc and 2amp 18,000rpm no load, however they do not have brushes and do not have an external controller. More voltage gives higher speed, can you explain what they are and how they operate? Forgive me my ignorance, but what do you mean by the "size" of a motor, when you say "540-sized ferrite "can" motor"? Mark, the article was originally written for electric model aircraft hobbyists. “540” refers to a “can” style ferrite-magnet motor with a 54mm armature length. Most brushed R/C car motors fall into this category. A very nice article.. Keep it up!! I do not understand why model aircraft would use electric over gas engines. The weight of the batteries seems much more than the weight of gas. I would expect the weight of electric motor to be more than gas engines considering how simple gas engines can be. And of course the actual power in gas is hugh compared to batteries. A gallons worth of gas fumes can blow my garage into splinters but my car battery can only make my car starter crank for a few minutes. Electric battery powered cars cannot compete with gas powered ones. John, welcome to the 21st century! There are a number of reasons why one would use electric over gas (or glow fuel). For one thing, the power to weight ratio of electric has gotten to the point where most electric planes are lighter than an equivalent gas or glow plane. Part of this is due to the great advances in battery (Lithium-Polymer) and motor (rare-earth brushless) technology. Part of this is due to the fact that an electric plane can be built lighter because there is almost no vibration. Another point is cost. An electric motor, battery, and charger will cost a little more up front than an engine, but you never have to buy fuel. Have you priced model airplane fuel lately? As far as electric cars not being able to compete with gas powered ones, I think that’s mainly a matter of politics. There are companies building electric cars that leave gas powered cars in the dust (take a look at http://wwlamotors.com). If GM or Ford sold these, no one would buy gas any more. Can you please tell me the name of the book and its authors, from which you studied "how motors work". Most of the books on electric machines don’t even mention the basics that you do… keep up the good work Stefan! It is not only informative but also a "well explained" article even for a person with basic knowledge in E&M. I also like this article. Well done. Very easy to understand and gave me enough basic facts to get me going. Thanks! For something that can be hard to explain, you’ve made it so clear and simple, it’s a real gift. Thanks for the article! Great Explanation !!! Thank you a lot. The explanation was very easy to understand. Thanks a lot. If u have more e-books on electrical machines please can you send me to my e-mail. Thanks for the explanation about principles of brushed/brushless motor. I can surely say now that I do know more about motors than before. 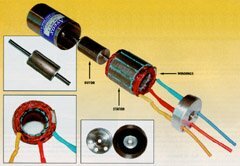 I found your info on how brushed and brushless motors work very understandable and helpful. Do you have any thoughts on brushless motor applications for a wind turbine and besides building one myself, where one could find one that would produce enough current under low r.p.m.s? Thanks again! I found you article very helpful and simple and completely detailed. I have never seen an explanation of motor like the one above. Always it is a coreless coil which is shown to be rotating 🙂 Also, can you please post more about the working of Brushless motors, how exactly the ESCs do the timing and the back emf and all. It would be a very useful resource as I have not seen any resource till now which gives these in detail. This is the best explanation on motors I’ve ever come across. Thanks a lot. I will share this with all my friends. can a brushless motor be used like a brush motor as a generator? My HEARTFUL thanks to you, all my confusion lost, after I read this. I never found like this explanation before, beyond this nothing to say. The best explain of dc motor for students. After trying to understand electric motors for a week scouring the internet for information that made sense I have finally been enlightened! thank you! An excellent conceptual dissertation for laymen like me! Thank you for creating this insightful article. Good article, useful for my job. Thanks very much. Excellent article! Really helped me in understanding basic machine principle. Thanks a ton for such a clear and well described article. This is the best site for understanding basics of how motors work. Can’t thank you enough!! Excellent explanation!! Thank u!! But i think if u can give the diagrams of windings how they are wrapped around then it will be more efficient. Great work Stefan. I’ve just built a kit three slot brush motor for my ten year old boy’s school science project. Now I can at least explain to him how it works. In hindsight, however, I reckon he and his mates would be better off just to understand the concept and reality of an electromagnet before a complete motor. Despite your diagrams, it appears that one has to do lots and lots of copper wire windings! Holy…! This was an awesome explanation on the 3-electromagnet armature. Other explanations online were just so vague; as if if you knew how a 2-pole armature works, then you should automatically know how a 3-electromagnet armature works. While that may work for some people, I really needed more details. Thank you so much. disribed motor functions so simply and i got lot of knowledge thanks. Very interesting. That was very usefull for me. Good graphics. This helped me very much with my school report about motors! Thank you! Thought that this is perfect to teach my son about electric motors but ended up reading, thinking and enjoying this article very much! Need more info on single phase DC brushless motors as in PC fans. How can I use and control this as motor in a miniature aeroplane. Glad you liked my article Peter! To control a brushless motor, you need to either buy or build a brushless motor speed control. I’ve designed some brushed motor controls, but no brushless ones. A good source of ones to buy is Castle Creations (http://www.castlecreations.com). Thank you- this helps explain motors and electromagnets to my fourth grade students. thank you for your help for the anthers;but I want have more about the uses and the instruction in the construction (physical operation and equation,and mathematics to) please send it to my e-mail. Do you think it would be possible for me to build a motor which i can use to power a mini toy car? Also the mini car is to be powered by some solar cells..so effectively making a motor for a mini solar car??? pls tell me how a airplane work. It would be more helpful if the webpage shows information on how a ESC division works. That would complete everything on BLDC. I am planning to build my own ECS controller. i didn’t notice any amount of math while scanning the presentations…..
so how can we use these spinning magnets in an electric motor, how do they produce a current? and how can they be hooked up to say a light globe? I’m oing a school project on electric motors and the underlying physics can you help me out? we can see two magnets in the motor.the armature(or rotor) is an electromagnet,while the field magnet is a permanent magnet.explain how electric motors work. ?? ?? and Jack, the whole article explains how electric motors work. Jack, perhaps you are thinking of a generator, not a motor. A motor can be used as a generator. The only difference is that instead of current producing magnetism, the motion of the armature through the magnetic field produces current. I found this article to be straightforward and easy to follow. Exactly what I was looking for. Thanks! Outstanding explanation. It was exactly what I needed. thank you! I found the article very good, But I am having trouble working out how many poles there are in a motor I have. I have a 12V 300Watt DC brushed motor I am using in a model boat & can’t get a ESC to run the motor. The motor is from a Holden Commodore air fan, Korean made for Air International.The armature is made up of 12 segments it has 2 brushes running on 12 segments on the commutator. If you can help me understand how to know the number of poles this motor has it would be very much appreciated. thanks for ur article it helps me a lot ur electric motor concept is wonderful… again thank u very much!! I usually don’t post things like this, but I must admit. This is the best and easiest explanation to follow when it comes to simple motors. I sifted through so many sites and old textbooks trying to find an easy explanation. Great tutorial. I had been browsing the net for hours before I found your site and it’s awesome diagrams. Now I understand electric motors! Thank you! thank you for article it was very helpfull to me anderstanding how brushless motor works. Hi, the way you explain how these motor works is remarkable. Could you give me the relation between the color code of the wiring (red,black,yellow)and the phase? Illias, there’s no standard for the colours of the wires on a brushless motor. Some motors have all three wires the same colour. Just hook it up, and if it runs the wrong way, exchange any TWO of them. In the last paragraph, you mention stepper motors. Do we not use stepper motors for the servos in our planes? No Jeffrey, the motors in our servos are just regular motors, driving a gear train, which in turn drives a feedback potentiometer. The circuitry in the servo runs the motor until the desired position is achieved on the potentiometer. i want to have an idea on how to build an electric motor for 5Horse power CAR..it my school project work. Excellent simplified description of how motors work. Thank you for the time and effort. nice. now i can understand it. I am teaching myself to repair old toy trains. You explaination is fantastic! You will never know how much it helped. Thank you! Thanks for a great article! What is the most efficient way to drive a brushless motor? Sine, pulse, trapezoid or something else? I have found different methods all over the web but no good explanations for what is most efficient for reducing vibrations while maximizing energy efficiency and acceleration/torque. I’ve never looked into it in great depth Niklas, but I would suspect that properly timed sine waves would be the best from the motor’s point of view. However, if you’re generating those from DC, then some sort of transistor needs to produce those sine waves at sufficiently high currents, and you will run into inefficiencies there (a transistor is most efficient when it is either fully on or fully off). So from an overall system point of view, I’d guess that square waves are most efficient. Wouldn’t you use a transistor anyways to vary power supplied to the spools? Or am I mixing up amps and volts here? Im thinking it would make sense to read rotation either via hall effect or EMF and only load the coils with enough power to sustain rotation at given frequency. Ive made controllers for bipolar-steppers before and there I feed the coils with constant power because holding-power/positioning-consistancy was an issue and power consumption was not since it was not an airborne application. No, the transistors (MOSFETs typically) are used to switch power on and off to the individual windings. There are two independent switching rates going on: one related to the rotational position of the motor, and the other related to the desired speed (i.e. PWM). I suppose you could use the latter, at a very high rate, to simulate supplying power sinusoidally. Well done Stefan, a well laid out and clear explanation, I built my first electric motor as a child. A very long time ago! I saw how the simple two pole motor (brushed) did not reliably start and how much better the three pole motors were. I also saw how brush timing could alter the characteristics. I stumbled across your article while looking for ideas regarding a motor for an rc buggy. i really like ur explanation but i want to make it on micro level level like in rc heli’s….so plz tell me how to do it?????????? For an electric rc model airplane who do I choose first, thinking longer flying time possible: motor or battery? outstanding, concise, and, as has been said before, you have a gift with your ability to make a complex topic easy to understand for even those starting with a limited knowledge base…however…I think the greatest aspect of the “gift” (having a powerful thirst for knowledge, a willingness to do the work required to gain that knowledge, and a high level of intelligence would be a more fitting description than “gift”, as I highly doubt you came out of your mommy’s tummy with a technical database already imported into your developing brain ;)…this is meant as a compliment, of course:) ), is your success in teaching someone like me (who has a very good understanding of electrical theory already) something new while delivering this “simplified”, “aimed at the beginner” article! That’s a very nicely done article,I absolutely love it.